Truth be told, I'm not than into historical fiction, be it young adult or not. I've discovered that they tend to bore me, and moreover, I often find it difficult to immerse myself in the worlds of the past. Nine times out of ten, I can barely understand the dialogue, and I can't even begin to imagine the clothes, the coiffure, and whatnot. It's not that the authors don't describe these things - rather, it's because that they describe them TOO much. Paragraphs and paragraphs talking about nothing but dresses and gowns tend to wind me down. Additionally, historical fiction tend to be absurdly long, and even if I find my interest piqued by the initial chapters of the novel, sooner or later, I'll end up bored. So just imagine my trepidation before I started Maid of Secrets - the blurb certainly caught my eye (despite being quite a history ignoramus I am rather fascinated with the reign of Elizabeth I), and I was fervently wishing that my reservation towards anything history-related wouldn't cloud my judgment. I have no idea how this happened, but the very first page - the very first passage, even, - of this novel had me hooked. And you know what the weird thing is? Those details that had me hating historical fiction in the past are what had me liking this very novel. Sure, the dialogue rings of 'ye olde past' (oh you know what I'm trying to get across), but I had no problem discerning what the characters were trying to say. Moreover, McGowan's vivid descriptions of the the day to day of past England - down to the many pockets sewed into the voluminous skirts of the main character - enriched her storytelling, and allowed me to envision this world that she wanted me to see, and I had no problem doing so. I was thoroughly impressed because McGowan was able to strike a fine balance between showing and telling - she gave me the necessary details I needed to clearly picture Elizabethan England, true, but she never went overboard with flowery descriptions and the like. Another thing that drew me to this novel was the mystery aspect, and the general plot itself. Come on, five maids especially handpicked by Queen Elizabeth herself to spy for her... who wouldn't want to read about that? These five are quite fascinating characters, most especially our MC, Meg. A talented thief, witty, and possessing a keen talent for mimicry and memorization, being in Meg's head as she goes through some of the most thrilling moments of her life is an enjoyable feat indeed. Meg soon discovers that things are even more convoluted on the inside - a previous maid was unceremoniously and grotesquely murdered with the killer still on the loose; some peculiar occurrings are causing mayhem in Windsor; and ultimately, some of the Queen's right-hand men are even asking Meg to spy on the Queen herself... Suffice to say that this novel is action-packed, and I never found myself bored! With spy training, spying on and for the queen - throw in her desperation to return home to her troupe - Meg has her hands full, but a Spanish Count throws the young maid in a loop. Count Rafe de Martine is very much part of the mystery inside Windsor Castle, and Meg has no idea if she should consider him a friend or a foe. One thing's for sure though, there's definitely something brewing between the two, and Meg has no idea what to make of it. I particularly liked how McGowan established the relationship between these two characters - she managed to give their blooming romance enough focus, but not too much that the proper pacing of the plot was cast aside. All in all, I say with no qualms whatsoever that both McGowan and her series have found themselves a fan in me. I'm excited to see what happens next! Awesome review! Thanks for the giveaway! I used to be a huge historical fiction lover before I started blogging. I really loved like medieval times when there were kings and queens. I loved the Royal Diaries series, and Carolyn Meyer's books. And then, once I started blogging, I read The Other Boleyn Girl by Phillipa Gregory and it is my favorite historical fiction book of all time. And this book looks really, really awesome! Okay, rant over lol. Sorry I get carried away. First off, Lyra, thank you SO much for your review! I literally teared up reading it. I am absolutely thrilled you enjoyed the book! Emily, thanks for posting as well! 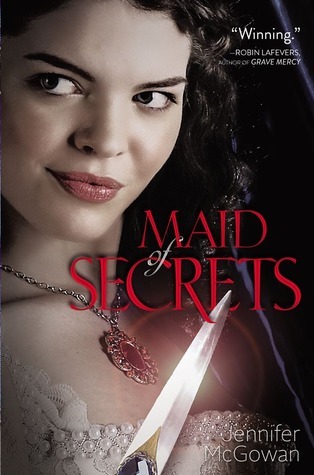 When I pitched Maid of Secrets, it was as a cross between Philippa Gregorgy and the Gallagher Girls (Ally Carter), so hopefully if you get a chance to read it, you'll find it enjoyable as well! What a fun twist, this looks like a treat. Thank you for sharing, I enjoy historical fiction and when there is a little something different thrown into the mix it can only get better. I must admit listing a favorite historical is difficult, I really enjoy Julie Garwood and would probable say The Secret. What a great review! I love historical fiction and I can't wait to get my hands on this book, it sounds amazing. Thanks for the giveaway! I think this book sounds exciting! I like historical fiction and this has a lot of action and intrigue to keep the story moving! Thanks for your great comments! I would love to win this book! And I think my favorite historical fiction book is Elizabeth I by Margaret George. I have not read Maid of Secrets yet but am very excited to! My favorite historical, oh boy, I have just discovered that I really like this genre and have no idea what my favorite is. Some recent reads are: Scarlet (the Gaughen one), Sovay, Grave Mercy, Sphinx's Princess + Queen, and my beloved Mara, Daughter of the Nile.